Do you like freebies? We know we do! 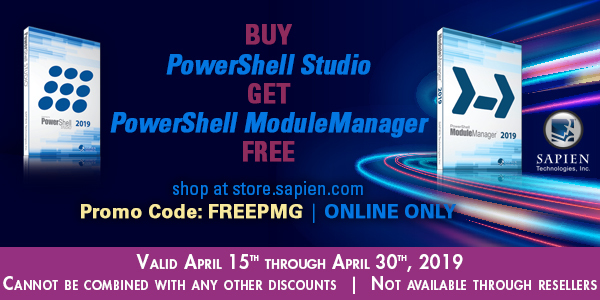 For the next two weeks, get PowerShell ModuleManager 2019 for FREE when you purchase a new license of PowerShell Studio, at MSRP price, directly from our SAPIEN Online Store. Don’t miss out. This deal ends April 30th, 2019 at Midnight PST. Use discount code FREEPMG to add PowerShell ModuleManager to your cart before check out! Questions, concerns, problems ordering? Send us an e-mail to sales@sapien.com so we can help. Restrictions: This offer is not available through resellers or through purchase orders sent to sales@sapien.com. This offer cannot be combined with any additional discounts. This offer is valid April 15th, 2019 through April 30th, 2019. No substitutions or exchanges of product will be permitted once purchased.